The Marijuana Conversation: Questions Workers Compensation Insurers Are Asking | Zeiler Insurance Services, Inc.
Over the next serval months, we will be diving into the National Council on Compensation Insurance (NCCI) Marijuana Conversation series aimed at exploring the issues surrounding marijuana’s impact on workers compensation stakeholders. "The Marijuana Conversation: Questions Workers Compensation Insurers Are Asking" is the first installment. Legalized marijuana, whether medical or recreational, is finding its roots nationwide. In those states that have legalized medical and/or recreational marijuana, stakeholders across the workers compensation spectrum are keeping a close watch on how these new laws will impact their organizations and constituencies. Not the least among those affected are workers compensation insurers. Questions abound at both the state and federal levels as to how the changing legal landscape surrounding marijuana will translate into the workers compensation system. Below are three key questions workers compensation insurers are asking regarding the growing adoption of permissible marijuana laws across the states. How does the federal Schedule I drug status of marijuana impact workers compensation? 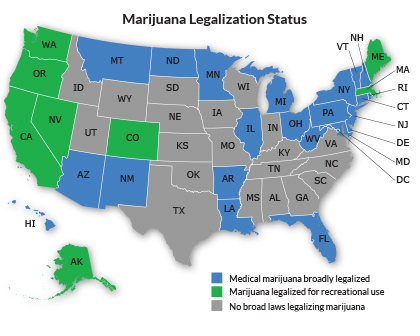 To date, medical marijuana is legal in 29 states, as well as Washington, DC. It’s also legal for recreational use in eight states—Alaska, California, Colorado, Maine, Massachusetts, Nevada, Oregon, and Washington—and Washington, DC. As many as 15 additional states are expected to consider marijuana proposals in the coming year. State legalization notwithstanding, marijuana is still illegal at the federal level and is classified as a Schedule I drug under the federal Controlled Substances Act. In recent years, federal practice has been not to enforce existing federal law in states that have legalized marijuana. In 2016, the US Drug Enforcement Administration announced that marijuana will remain a Schedule I drug and, while the current Administration’s Justice Department has spoken of enforcing existing federal laws, no actions have been taken to date. It remains to be seen whether the new Administration will make any changes to these policies. While marijuana remains illegal at the federal level, insurers are increasingly receiving requests to reimburse medical marijuana for workers compensation treatment. Given the friction between state and federal law, states and state courts are increasingly faced with the challenge of whether to approve medical marijuana as a permissible workers compensation treatment. Furthermore, as marijuana-related business continues to expand, the demand for insurance coverage is likewise growing. Insurers, in turn, are left wondering what issues they may face as a result of providing insurance for marijuana businesses or being required to reimburse for drug treatment that is illegal under federal law. For example, Hawaii Employers' Mutual Insurance Co. (HEMIC) recently decided to cancel workers compensation policies for medical marijuana dispensaries in Hawaii based on, according to news reports, legal opinions about potential exposure under federal law. Moreover, the Centers for Medicare & Medicaid Services (CMS) requires CMS healthcare providers to operate in compliance with federal law. So, what are the implications for workers compensation insurers when providing reimbursement for medical marijuana? In addition, marijuana cannot be assigned a National Drug Code due to its Schedule I status; therefore, there is no standardized reimbursement rate for the drug. Do states require workers compensation insurers to reimburse/pay for medical marijuana? To date, at least five states—Connecticut, Maine, Minnesota, New Jersey, and New Mexico—have found that medical marijuana is a permissible workers compensation treatment that requires insurer reimbursement. New Mexico was the first in 2014. In Vialpando v. Ben’s Automotive Services and Redwood Fire & Casualty, the New Mexico Court of Appeals ruled that insurers must reimburse “qualified” workers compensation claimants for the cost of medical marijuana to treat work injuries. The decision was appealed to the New Mexico Supreme Court, which denied review. More recently, in Petrini v. Marcus Dairy, Inc. and Gallagher Bassett Service, the Connecticut Workers Compensation Commission found that use of medical marijuana was reimbursable and constitutes reasonable and necessary medical treatment. And, in Noll v. Lepage Bakeries, Inc., the Maine Workers Compensation Board ordered a self-insured employer to reimburse an injured worker for costs associated with the “reasonable and proper” medical use of marijuana. Will required reimbursement for marijuana as a workers compensation treatment be an ongoing trend for state legislatures and courts? Workers compensation insurers will remain keenly interested as these developments unfold. Is medical marijuana a viable alternative to opioids for pain management, better claim outcomes, and getting employees back to work sooner? Opioid addiction and overdose have reached epidemic levels over the past decade. According to the Centers for Disease Control and Prevention (CDC), both the sales of opioid prescriptions in the United States and the number of deaths from opioid prescription drugs have quadrupled since 1999. And in 2015, more than 15,000 people died from overdoses of prescription painkillers. WorkCompWire cites a 2014 report in which three in four "injured workers are prescribed opioid medications for pain management," leaving case managers to witness patients "vulnerable to opioid abuse and addiction." Anecdotal evidence (as reported by The Atlantic in February 2017) suggests that medical marijuana (which is arguably different from recreational marijuana because it generally does not include tetrahydrocannabinol or THC—the chemical component that causes a "high") can be a viable alternative to opioids. For example, in the Bourgoin case in Maine noted above, the claimant had experienced severe chronic pain since 1993 and tried numerous medications, including narcotics, on which he became dependent. However, the claimant testified that since he began using medical marijuana in 2012, "his quality of life has improved, he experiences significantly less pain, he sleeps better, and no longer takes opioid pain medications or other narcotic drugs." While some anecdotal evidence may be supportive of the medical marijuana treatment argument, marijuana is still illegal at the federal level and research is only allowed under strict controls. In the coming years, university sponsored studies in states such as Colorado will lead to peer-reviewed scientific assessments that will help determine marijuana’s viability as a pain-relief alternative. But, for now, the questions remain. Is marijuana a safer alternative to opioids for pain management? Can marijuana treatment have a positive impact on medical costs, claim outcomes, and return to work in workers compensation? It remains to be seen. The legal use of medical and recreational marijuana is gaining traction at the state level across the country. The impact on workers compensation, however, remains fluid, and many questions remain as to how workers compensation insurers will adapt to this evolving landscape. Until the federal government reclassifies marijuana from its current Schedule I status or the new Administration intervenes and begins enforcing existing federal laws, it appears that states and state courts will continue to provide a state-by-state patchwork of laws that workers compensation insurers will have to navigate. Stay tuned for our next edition of The Marijuana Conversation, which will focus on questions employers are asking.